We’ve had a few mild days. This reminded many of us that spring is here – and my wife to say, “You’re not thinking of putting the boat in the water already, are you?” Well, much as I’d like to, I’ll bet Ol’ Man Winter has one or two surprises for us before spring finally chases him away. But even then the water will be cold for several weeks and you need to be aware of how dangerous that can be – if you aren’t prepared and savvy. This column is about that. Warm Air + Cold Water = Risks! OK, it is a beautiful day in April and you’re just dying to tool out for a while. And why not? How great is it when the waters are too cold for the algae and other microscopic sea life so you can see all the way to the sandy bottom? Great indeed, but don’t make way without a few simple but important precautions. Has the engine been prepped from its long winter snooze? Are you fueled up? Is there some fuel enhancer thrown in? Certainly, there is likely to be some condensation in the tank and that water will precipitate down to the bottom of the tank…and some might get sucked up into the engine…So, engine prepped, fuel tank full and fuel enhancer thrown in – or no-go! Be sure that your flotation gear has a whistle and an emergency strobe light attached. If you’ve invested in a PPIRB/PLB, great (see Atlantic Maritime, “EPIRBs, PPIRBs, GPIRBs – What?? ?” 11/29/06 and “Personal Locator Beacons Locate You!” 8/11/10.) And a reflector mirror would be superb. You can signal over 20 miles with one smaller than the size of your fist. Airline pilots are trained to call in sightings of targeted reflections. Review cold water survival techniques and risks with your crew. 1. If you fall in, get out. Even if you have to climb onto the hull of the over-turned boat (yes, Bunky, that happens! ), get out. Remember the ice cube experiment. 2. Limit your movements! Strenuous activity increases your heart rate, which increases the rate that blood, cooled at the surface of your body, is circulated to the central core – where it will kill you. Assume a Heat-Emitting Lessening Position (HELP) – in the water or out. Cross your legs to protect your groin area from giving up heat. Put your arms across your chest and your hands under your armpits to do the same thing. If you’re smaller, less time. If you’re larger, more time. And have a good meal before you make way. It will warm your body from the inside as the fires of digestion do their work. By the way, these times only are applicable if you are wearing a life jacket. If not, you will start to falter as muscle control fades with body temperature – and you will drown. You won’t be around long enough to get hypothermic. Captain Joe Vojvodich is the Captain of the Port and Sector Commander for US Coast Guard Sector Long Island Sound. Captain Vojvodich is responsible for all active-duty, reservist and auxiliary Coast Guard personnel within the Sector. 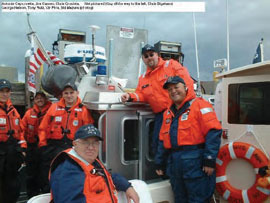 Vin Pica, Chief of Staff for the First District Southern Region in the US Coast Guard Auxiliary, works closely with Captain Vojvodich and his staff to promote boating safety in the waters between Connecticut, Long Island and 200 nautical miles offshore. Sector Long Island Sound Command Center can be reached 24 hours a day at 203-468-4401. Rare listing and priced to sell! Single-owner MJM 40z in Downeast Red, nicely optioned by her very knowledgeable owner. Numerous upgrades including electric windshield actuators. See what all the buzz is about - an iconic Doug Zurn design in the hands of one of the most technologically advanced laminate shops in the USA, Boston Boatworks. Cruise at 30 knots burning just 25 gph, and park her anywhere with the ease of joystick docking. Come see her in Mamaroneck, NY. Health forces sale of classic fibreglass centerboard sloop. Recent sails/standing, running rigging. Foredeck recored, Lewmar 44 ST, lazyjacks, bottom stripped, barrier coated, and fresh Vivid bottom paint. A4 engine removed and Honda 9.9 4s on stern bracket. Included are two complete and one partial A4. 5 Boat stands included. Price includes land delivery w/in SE Mass. or launch in Buzzard's Bay. Water, Water Everywhere, But What Drops Should You Drink?